3 The Role of Teachers Research into effective Languages programs clearly indicates the critical role that the teacher plays in motivating students and ensuring quality outcomes. As professionals in our field, we know how to deliver quality programs; first and foremost, any school Languages Program should empower us to do just this. 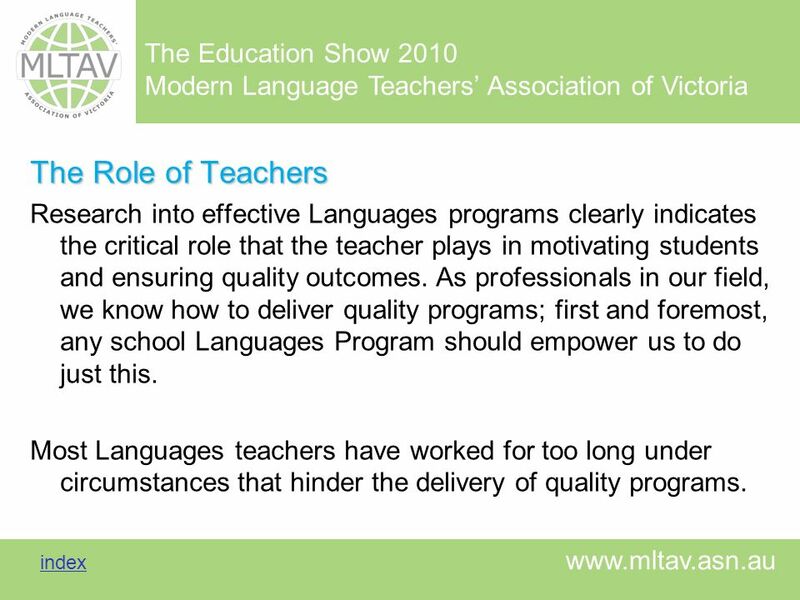 Most Languages teachers have worked for too long under circumstances that hinder the delivery of quality programs. 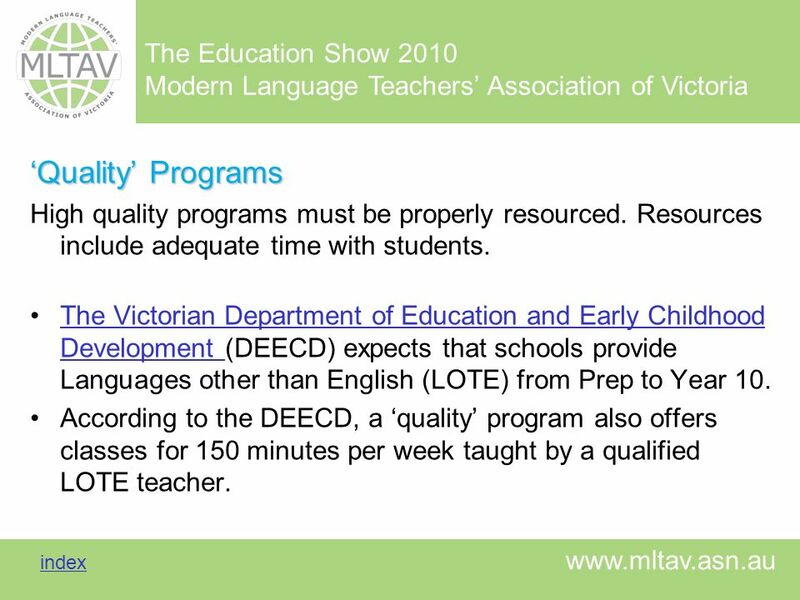 4 ‘Quality’ Programs High quality programs must be properly resourced. Resources include adequate time with students. 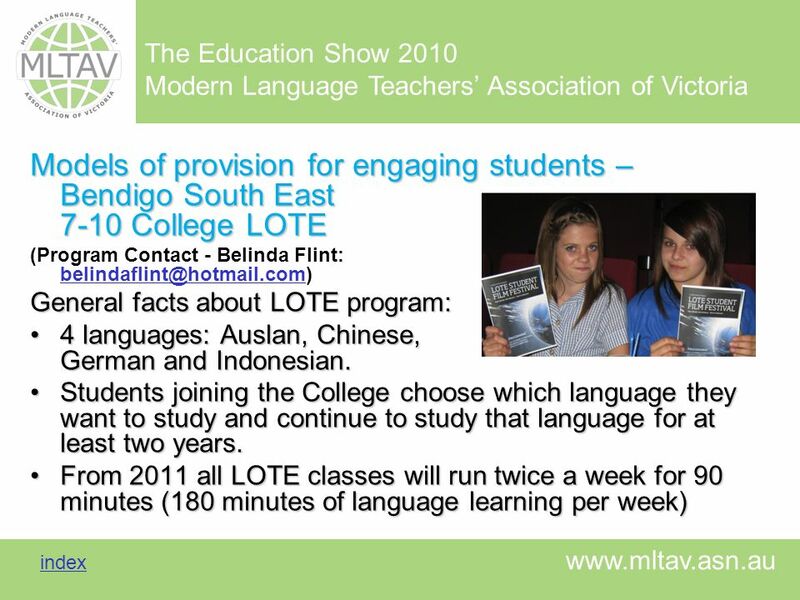 The Victorian Department of Education and Early Childhood Development (DEECD) expects that schools provide Languages other than English (LOTE) from Prep to Year 10. According to the DEECD, a ‘quality’ program also offers classes for 150 minutes per week taught by a qualified LOTE teacher. 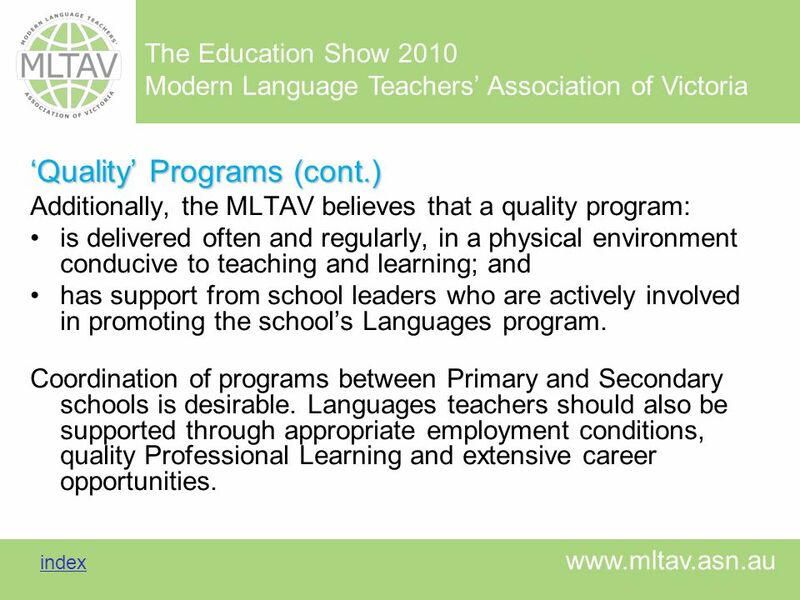 Additionally, the MLTAV believes that a quality program: is delivered often and regularly, in a physical environment conducive to teaching and learning; and has support from school leaders who are actively involved in promoting the school’s Languages program. Coordination of programs between Primary and Secondary schools is desirable. Languages teachers should also be supported through appropriate employment conditions, quality Professional Learning and extensive career opportunities. 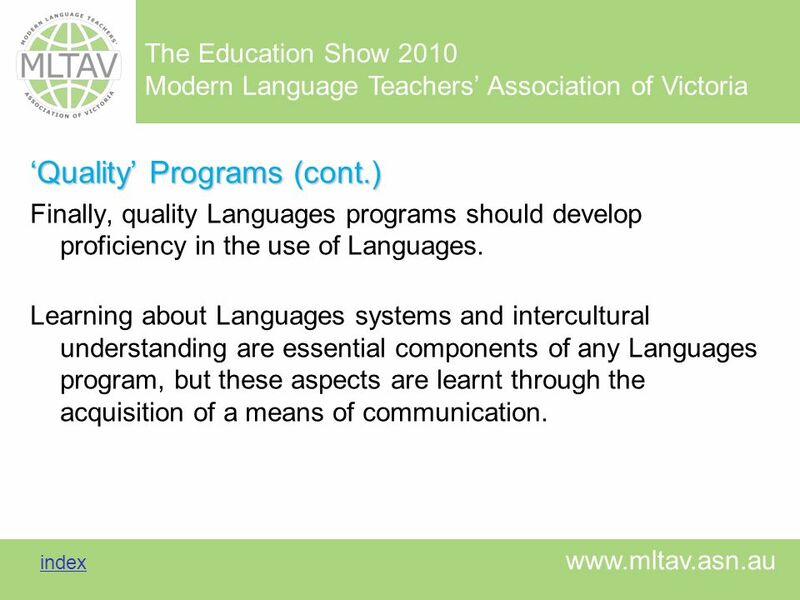 Finally, quality Languages programs should develop proficiency in the use of Languages. Learning about Languages systems and intercultural understanding are essential components of any Languages program, but these aspects are learnt through the acquisition of a means of communication. 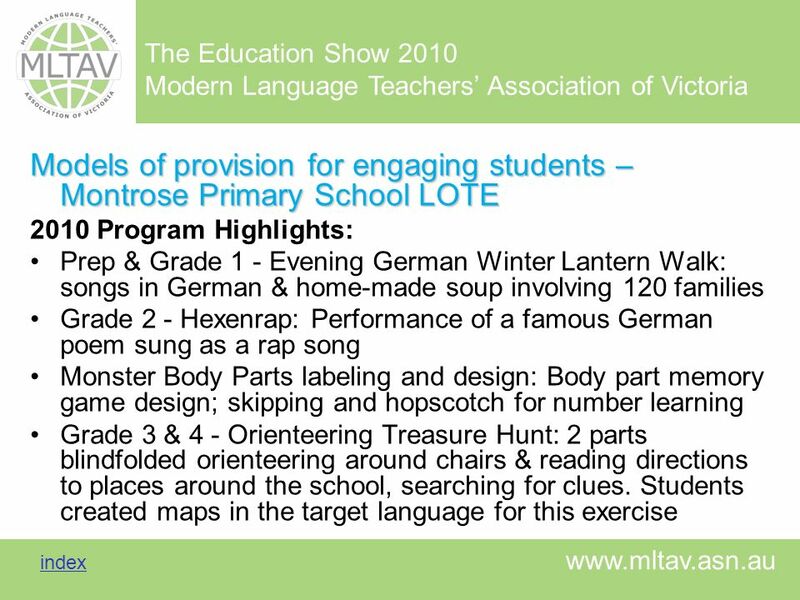 2010 Program Highlights (cont. 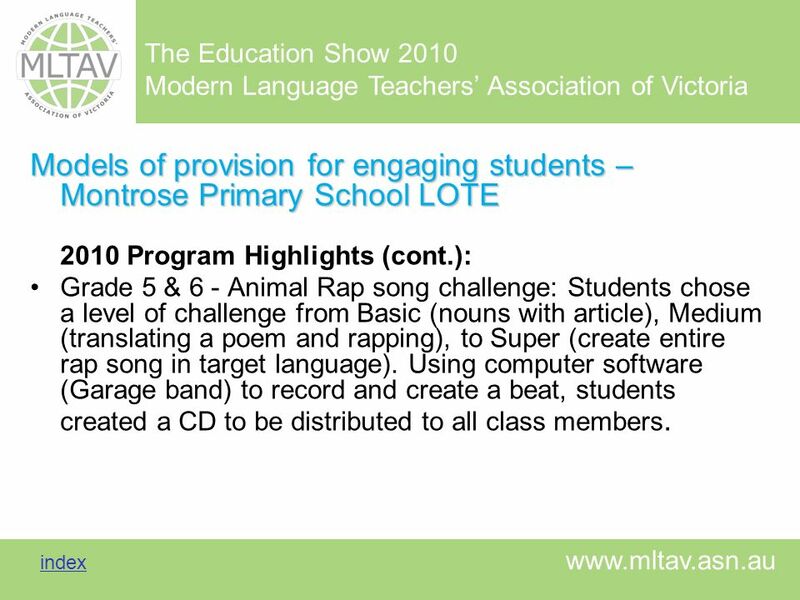 ): Grade 5 & 6 - Animal Rap song challenge: Students chose a level of challenge from Basic (nouns with article), Medium (translating a poem and rapping), to Super (create entire rap song in target language). Using computer software (Garage band) to record and create a beat, students created a CD to be distributed to all class members. (Program Contact – Jaclyn Curnow: Mill Park Secondary College encourages all students to create their future. LOTE plays an important role as students learn about cultures and language. Students are offered the choice between two European languages: German and Italian. Students learn one language during Years 7 and 8. There are elective classes at Years 9 and 10 and VCE classes. 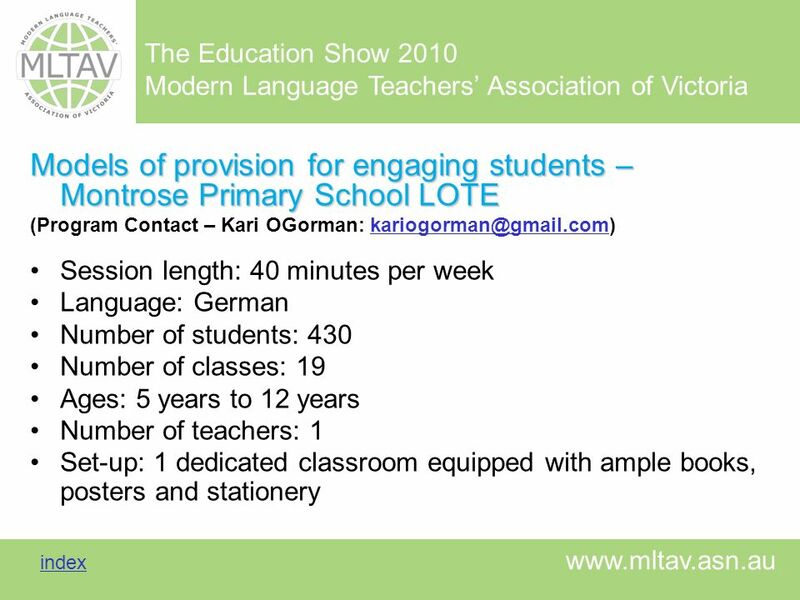 LOTE is timetabled for 6 x 49 minutes over a fortnight for Years 7 and 8. For Senior classes there are 8 sessions. 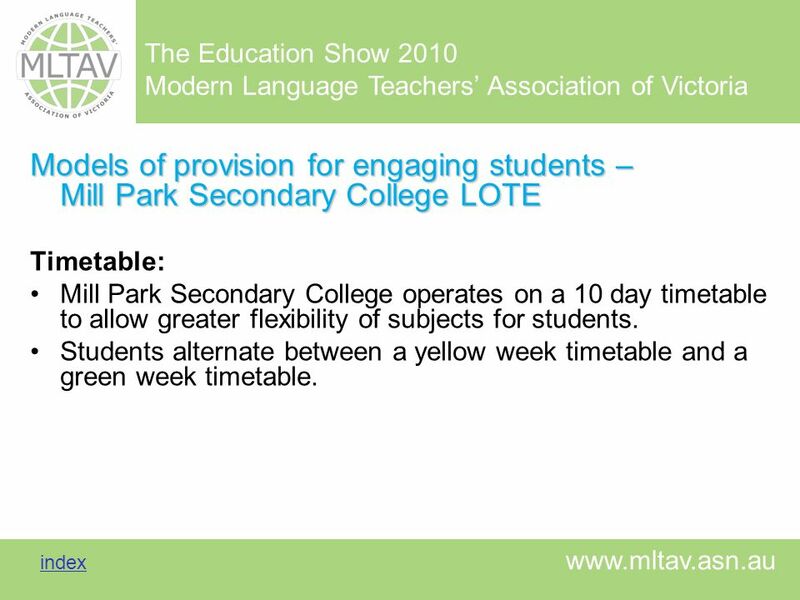 Timetable: Mill Park Secondary College operates on a 10 day timetable to allow greater flexibility of subjects for students. Students alternate between a yellow week timetable and a green week timetable. 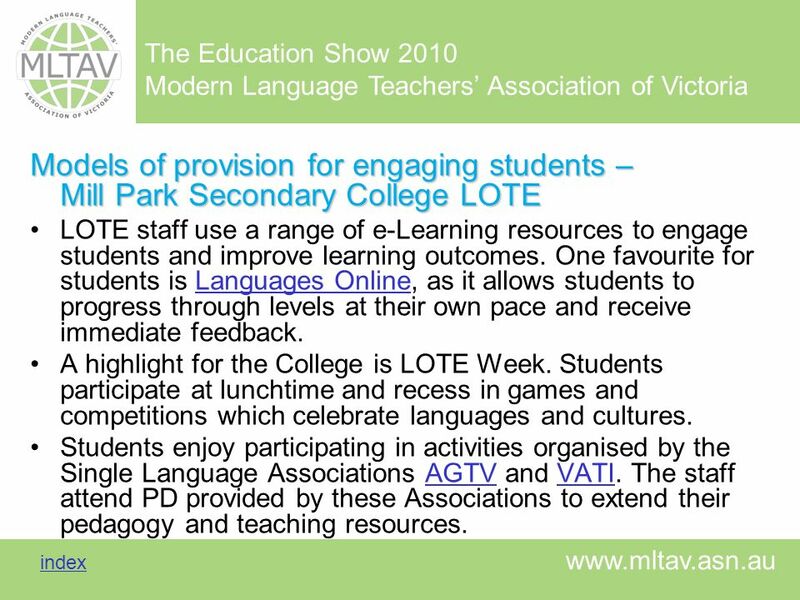 LOTE staff use a range of e-Learning resources to engage students and improve learning outcomes. One favourite for students is Languages Online, as it allows students to progress through levels at their own pace and receive immediate feedback. A highlight for the College is LOTE Week. Students participate at lunchtime and recess in games and competitions which celebrate languages and cultures. Students enjoy participating in activities organised by the Single Language Associations AGTV and VATI. The staff attend PD provided by these Associations to extend their pedagogy and teaching resources. 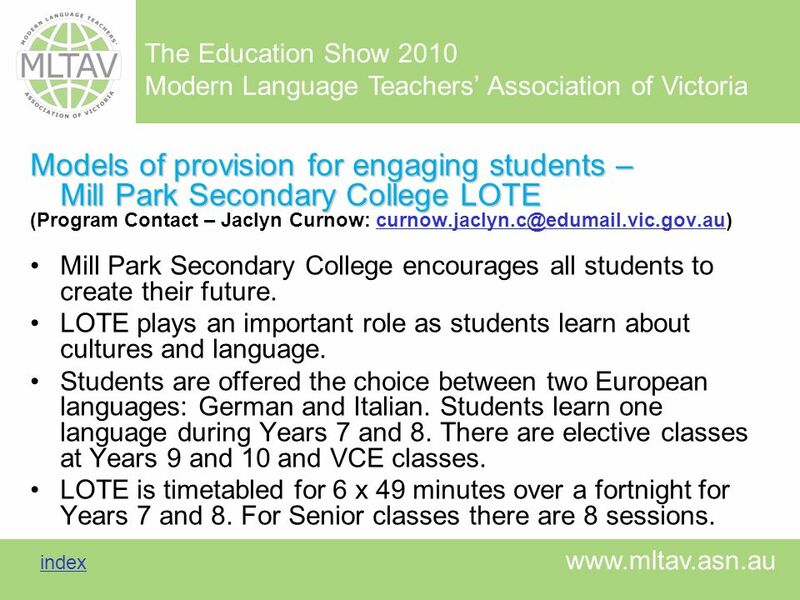 Measures put in place to support and complement students’ language learning: All students who choose to do LOTE in Years 9 & 10 are guaranteed their place in a class. 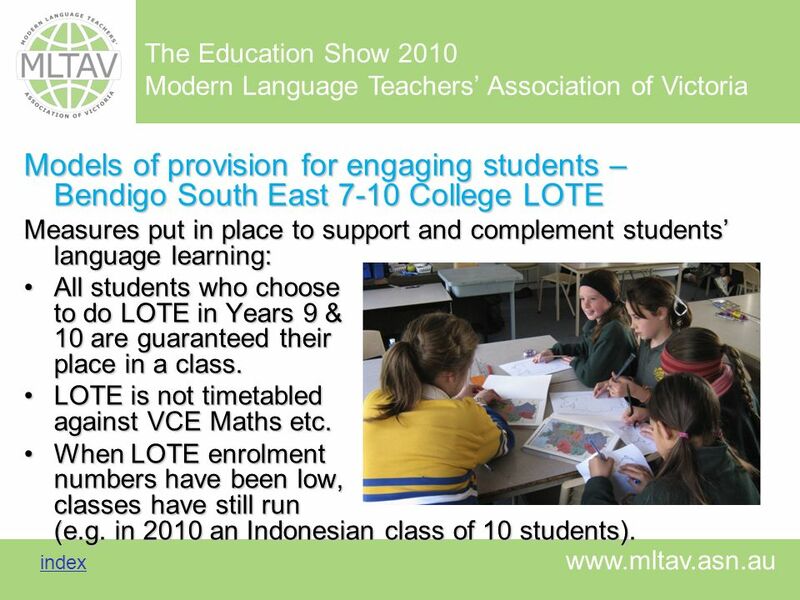 LOTE is not timetabled against VCE Maths etc. When LOTE enrolment numbers have been low, classes have still run (e.g. in 2010 an Indonesian class of 10 students). Exchange, competition, festival and excursion opportunities for LOTE students: Students are encouraged to perform in the Loddon Mallee Region’s ‘Students Celebrating LOTE Festival’ each year. The College is part of the Australia-Indonesia Bridge Program through which there are strong ties with schools in Indonesia for collaborative projects. 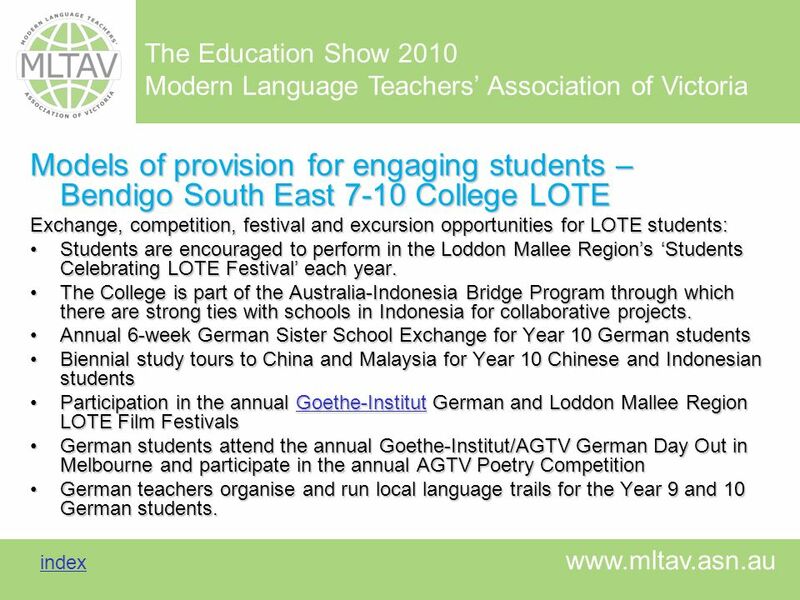 Annual 6-week German Sister School Exchange for Year 10 German students Biennial study tours to China and Malaysia for Year 10 Chinese and Indonesian students Participation in the annual Goethe-Institut German and Loddon Mallee Region LOTE Film Festivals German students attend the annual Goethe-Institut/AGTV German Day Out in Melbourne and participate in the annual AGTV Poetry Competition German teachers organise and run local language trails for the Year 9 and 10 German students. 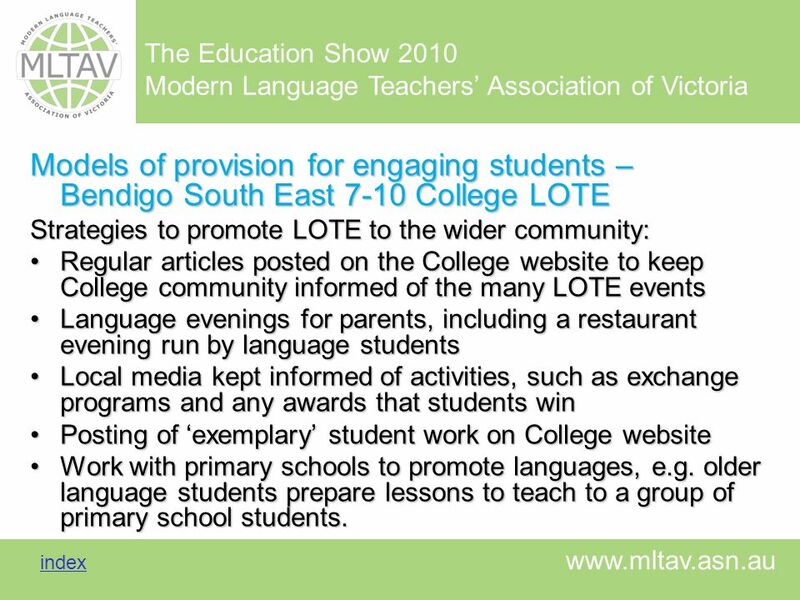 Strategies to promote LOTE to the wider community: Regular articles posted on the College website to keep College community informed of the many LOTE events Language evenings for parents, including a restaurant evening run by language students Local media kept informed of activities, such as exchange programs and any awards that students win Posting of ‘exemplary’ student work on College website Work with primary schools to promote languages, e.g. older language students prepare lessons to teach to a group of primary school students. 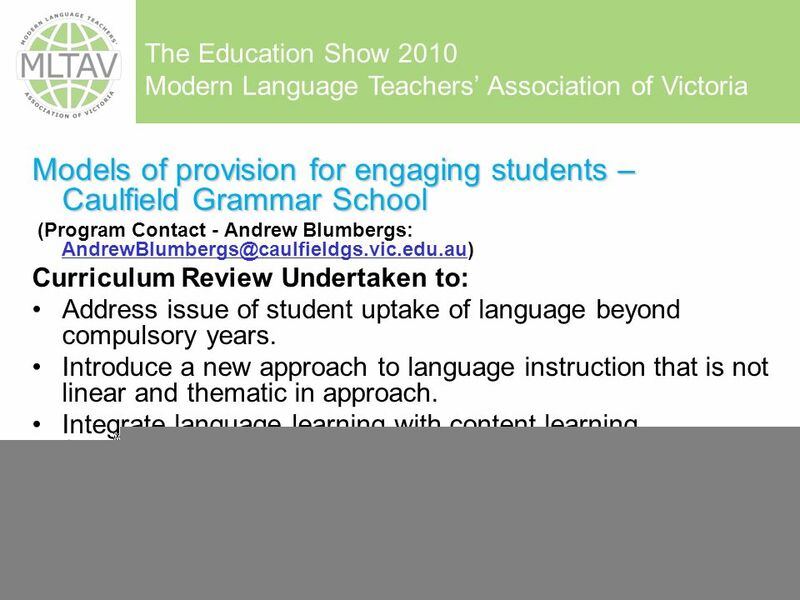 (Program Contact - Andrew Blumbergs: Curriculum Review Undertaken to: Address issue of student uptake of language beyond compulsory years. Introduce a new approach to language instruction that is not linear and thematic in approach. Integrate language learning with content learning (i.e. Content-Based languages learning). Address student perception questioning relevance of learning European languages (i.e. Asian focus). 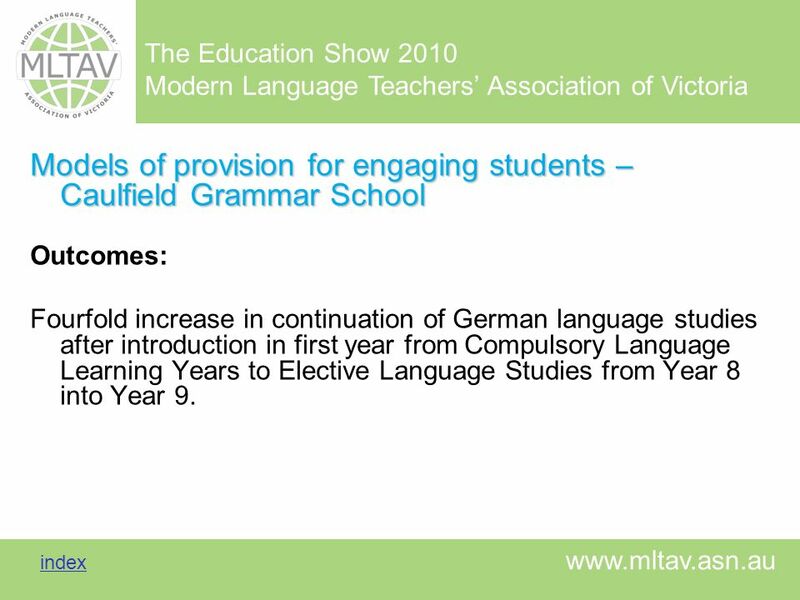 Outcomes: Fourfold increase in continuation of German language studies after introduction in first year from Compulsory Language Learning Years to Elective Language Studies from Year 8 into Year 9. 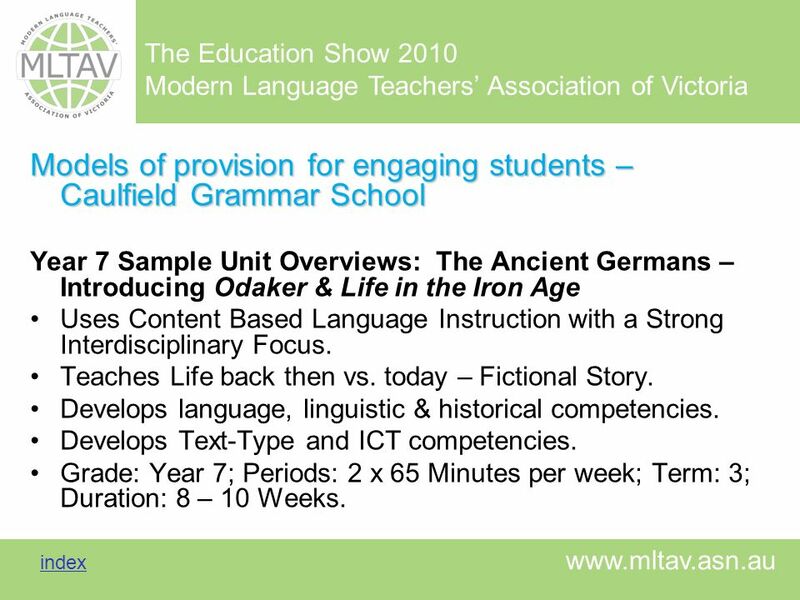 Year 7 Sample Unit Overviews: The Ancient Germans – Introducing Odaker & Life in the Iron Age Uses Content Based Language Instruction with a Strong Interdisciplinary Focus. Teaches Life back then vs. today – Fictional Story. Develops language, linguistic & historical competencies. Develops Text-Type and ICT competencies. Grade: Year 7; Periods: 2 x 65 Minutes per week; Term: 3; Duration: 8 – 10 Weeks. 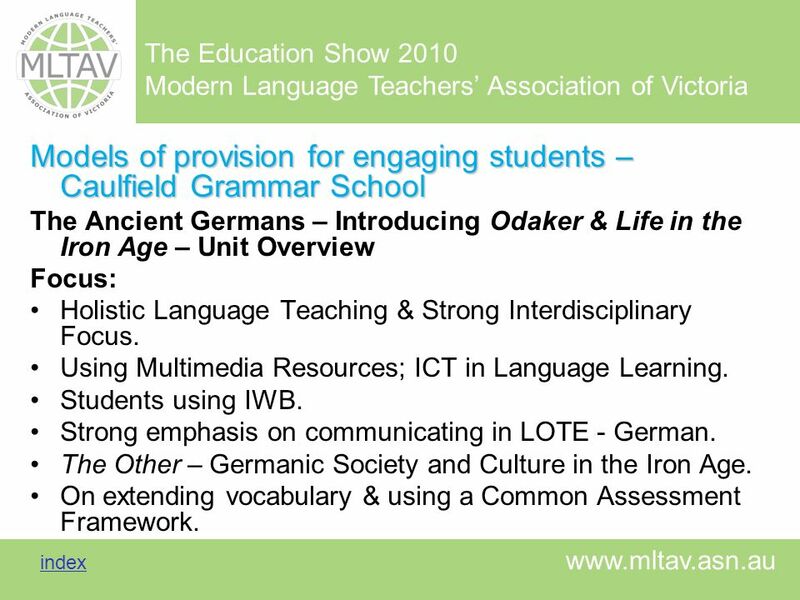 The Ancient Germans – Introducing Odaker & Life in the Iron Age – Unit Overview Focus: Holistic Language Teaching & Strong Interdisciplinary Focus. 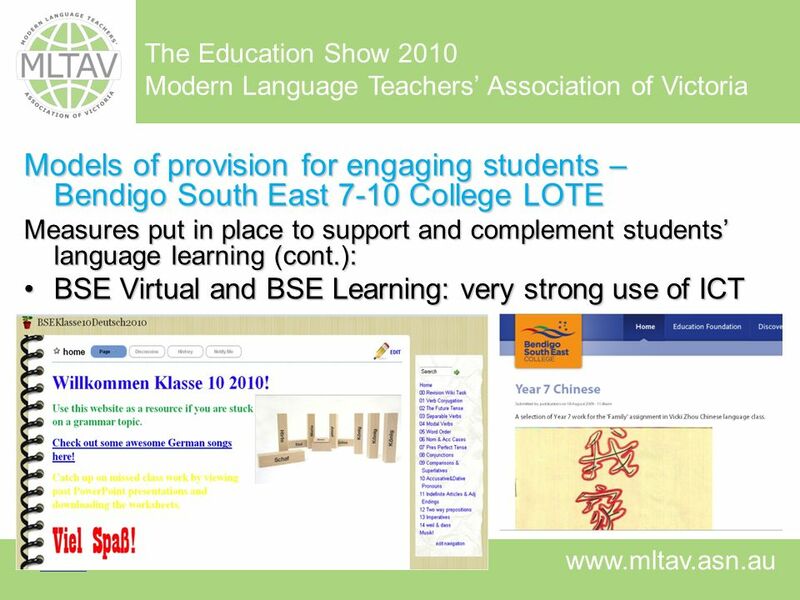 Using Multimedia Resources; ICT in Language Learning. Students using IWB. Strong emphasis on communicating in LOTE - German. The Other – Germanic Society and Culture in the Iron Age. On extending vocabulary & using a Common Assessment Framework. Year 7 - Sample Unit Overviews: German Expressionism Teaches through Art, Society & Culture, focusing on the Expressionist Art Movement of the Early C20. Grade: Year 7; Term: 2; Duration: 8 – 10 Weeks. 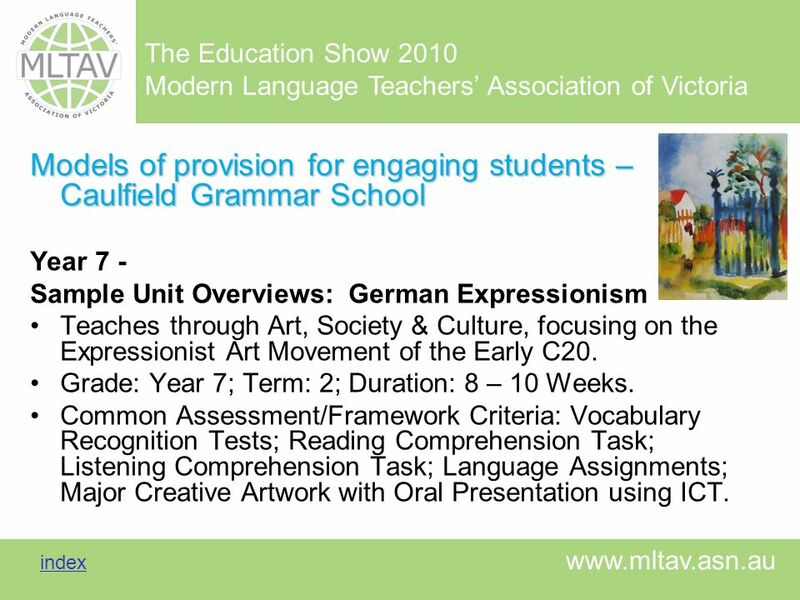 Common Assessment/Framework Criteria: Vocabulary Recognition Tests; Reading Comprehension Task; Listening Comprehension Task; Language Assignments; Major Creative Artwork with Oral Presentation using ICT. 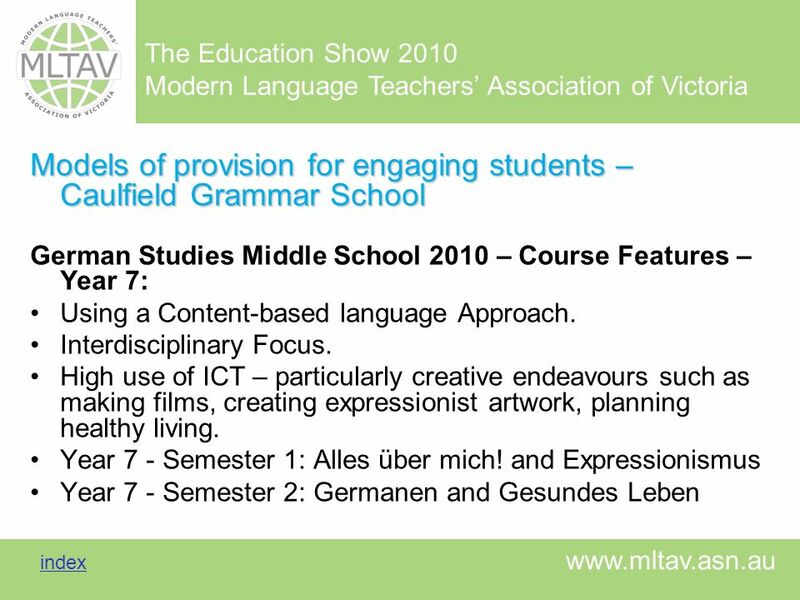 German Studies Middle School 2010 – Course Features – Year 8: Using a Content-based language Approach. Interdisciplinary Focus. 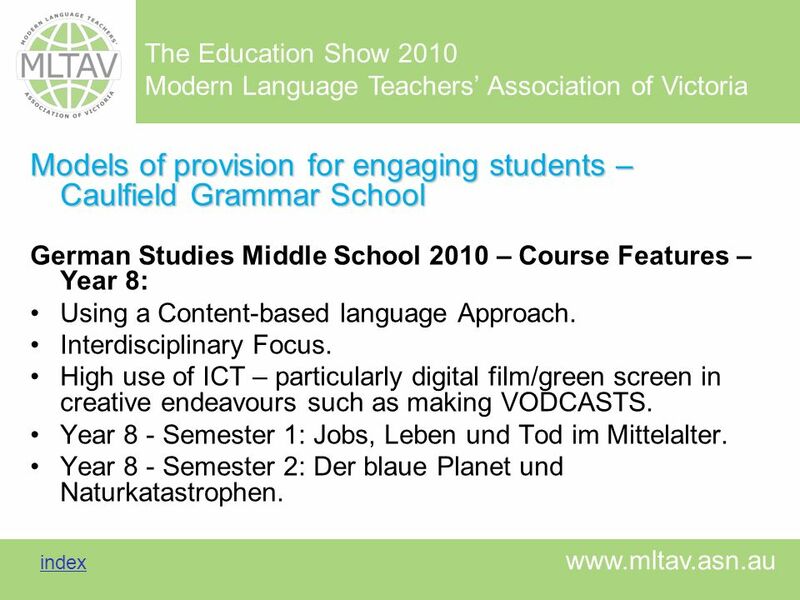 High use of ICT – particularly digital film/green screen in creative endeavours such as making VODCASTS. Year 8 - Semester 1: Jobs, Leben und Tod im Mittelalter. Year 8 - Semester 2: Der blaue Planet und Naturkatastrophen. 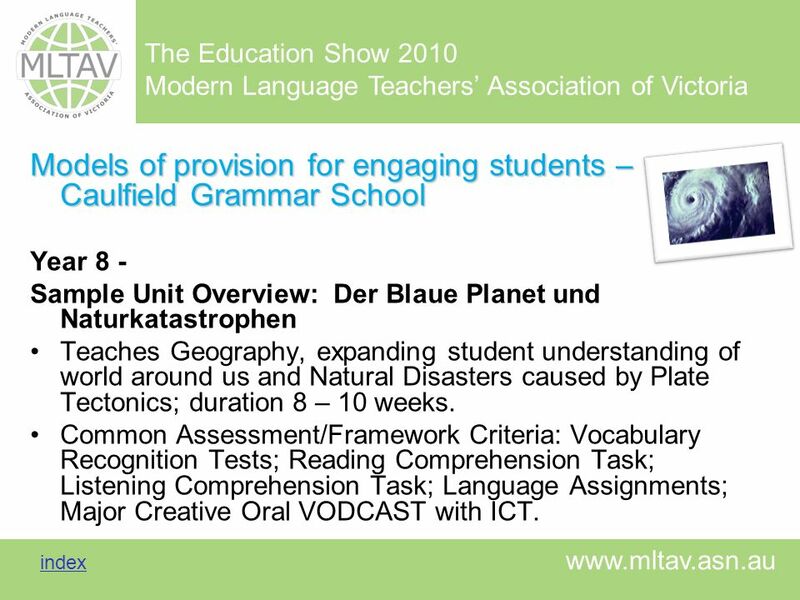 Year 8 - Sample Unit Overview: Der Blaue Planet und Naturkatastrophen Teaches Geography, expanding student understanding of world around us and Natural Disasters caused by Plate Tectonics; duration 8 – 10 weeks. 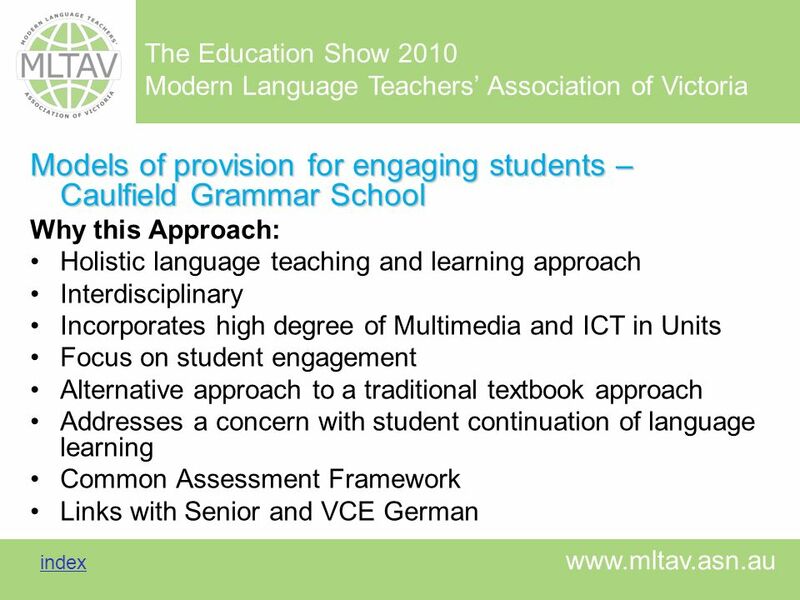 Common Assessment/Framework Criteria: Vocabulary Recognition Tests; Reading Comprehension Task; Listening Comprehension Task; Language Assignments; Major Creative Oral VODCAST with ICT. 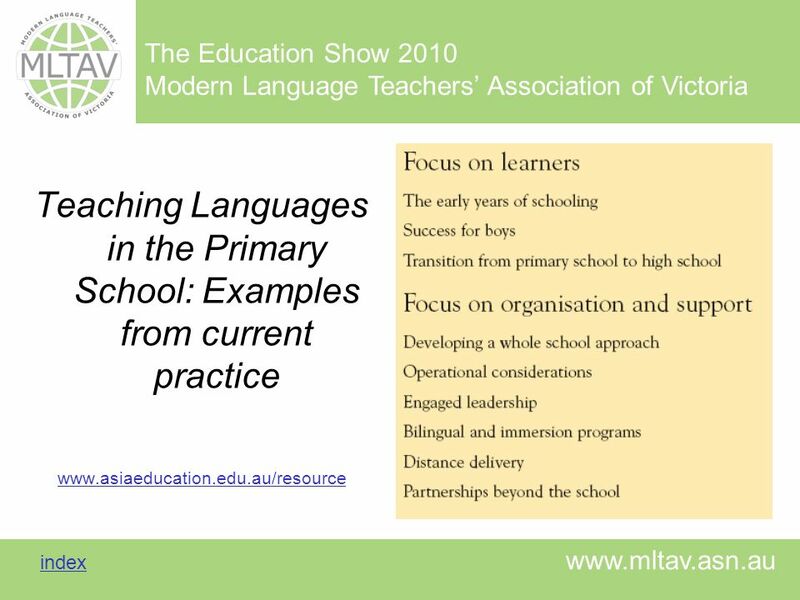 For school leaders, teachers and school communities: A summary of conversations, discussions, observation and interviews on the topic of language acquisition: Interviews with academics in Victoria and SA with a focus on different elements related to language acquisition. Interviews with principals, who discuss Languages programs in their schools, their beliefs, their experiences. Interviews with Teachers on Languages, cultural knowledge, technology, etc. 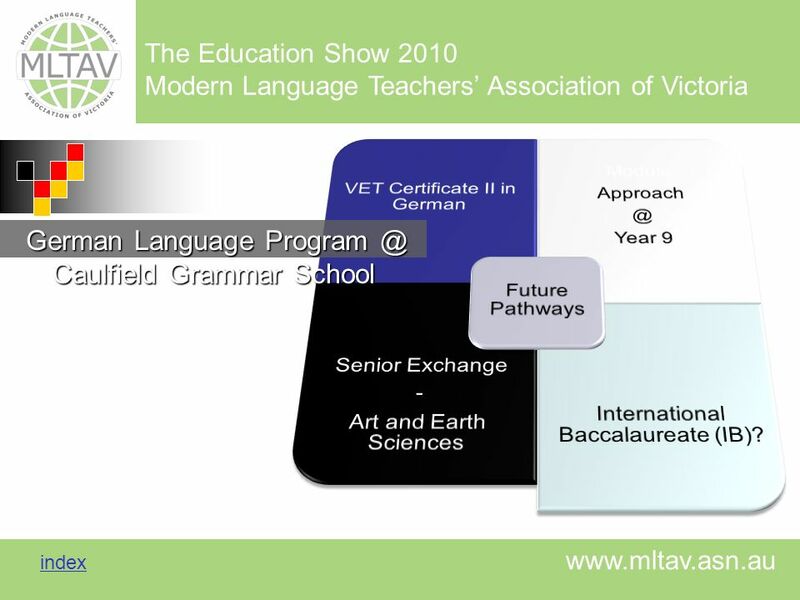 Footage of class activities in Languages programs, in a variety of schools in Victoria, at all levels. Footage of immersion teaching from a bilingual program. 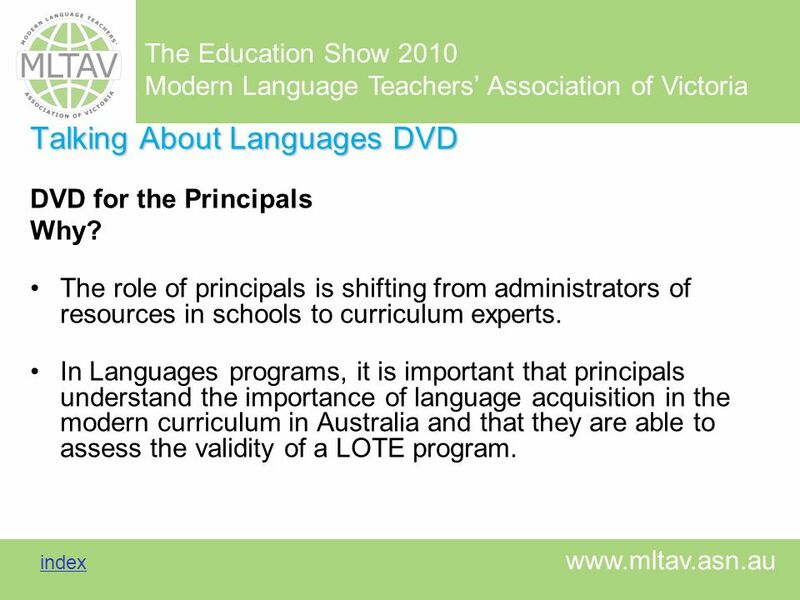 DVD for the Principals Why? The role of principals is shifting from administrators of resources in schools to curriculum experts. 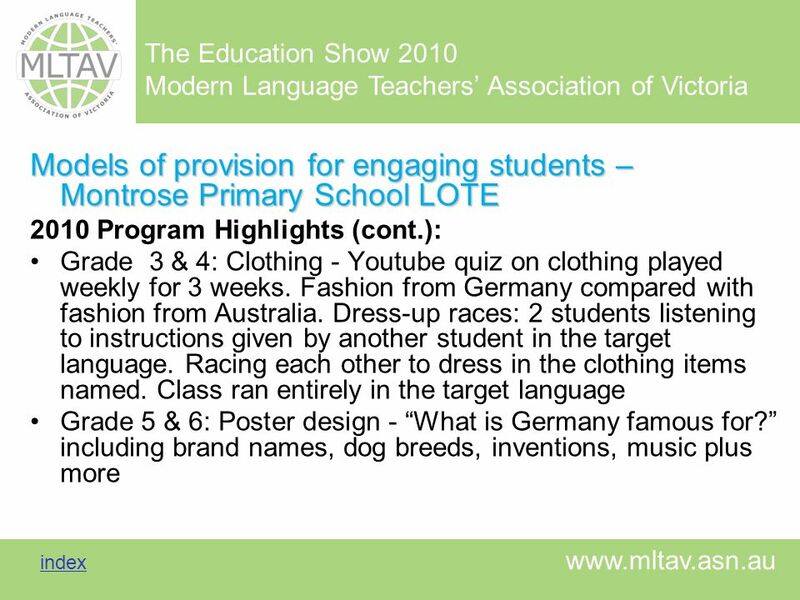 In Languages programs, it is important that principals understand the importance of language acquisition in the modern curriculum in Australia and that they are able to assess the validity of a LOTE program. DVD for the Teachers Why? They are incredibly motivated and dedicated and deserve much more exposure in what they do. Will profit from listening to the academics in matters of pedagogy and methodology, especially Dr John Lando and Dr Margaret Gearon. Will be able to use segments of the DVD to promote Languages programs in their schools. Will be able to use suggestions and strategies from DVD. Will be better able to comprehend the vision of principals. DVD for the School Community Why? 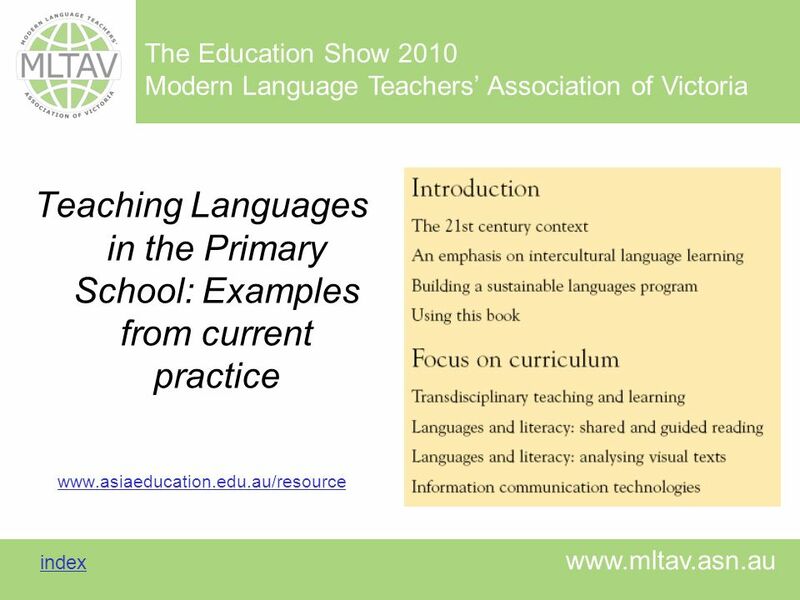 Presents overwhelming evidence to support why it is essential for Australian students to study additional languages (interviews with Professors Michael Clyne and Joe Lo Bianco). Highlights the essential link between cognitive development and literacy and languages (interview with Associate Prof. Angela Scarino). 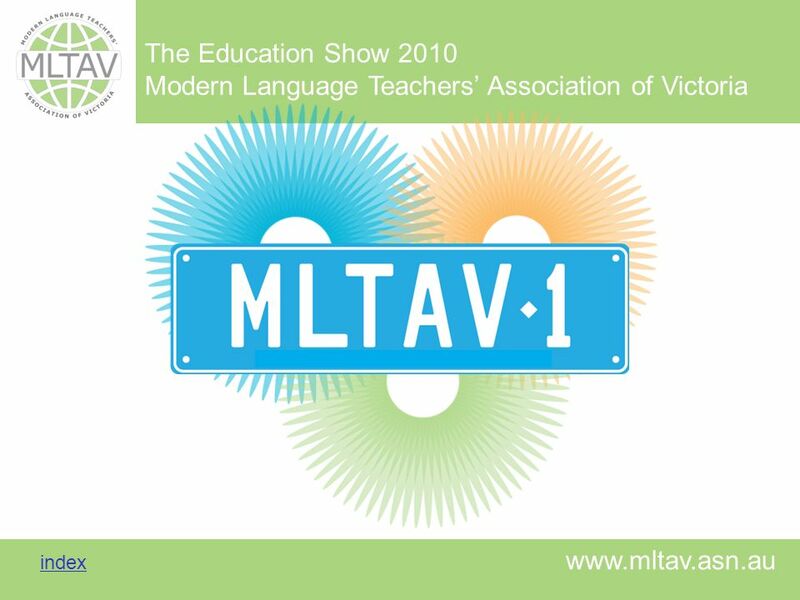 DVD Distribution (Contact Viviana Golding: All schools in the BSW Region and Loddon Mallee Region will receive a copy, free of cost. Schools outside these two regions are invited to purchase copies through the BSW and Loddon Mallee Regional Offices. The complete series of interviews with the academics will be available as addenda at a cost per CD (there may be a possibility of releasing the interviews on YouTube). 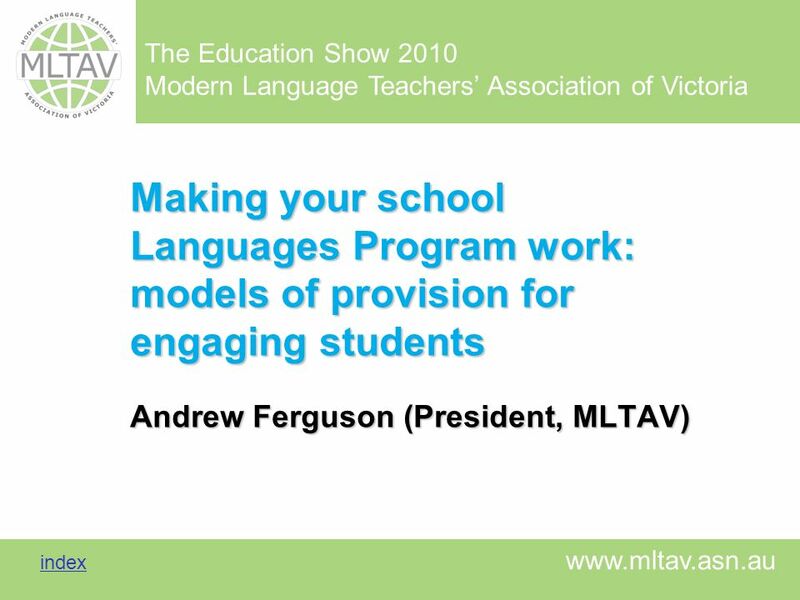 Download ppt "Making your school Languages Program work: models of provision for engaging students Andrew Ferguson (President, MLTAV)"
Natalie Fong English Centre, The University of Hong Kong Good Practices in a Second Language Classroom: An Alternating Use of ICT in Independent Learning. Weber State University Teacher Preparation Program Levels, Field Experiences, and Assessments. 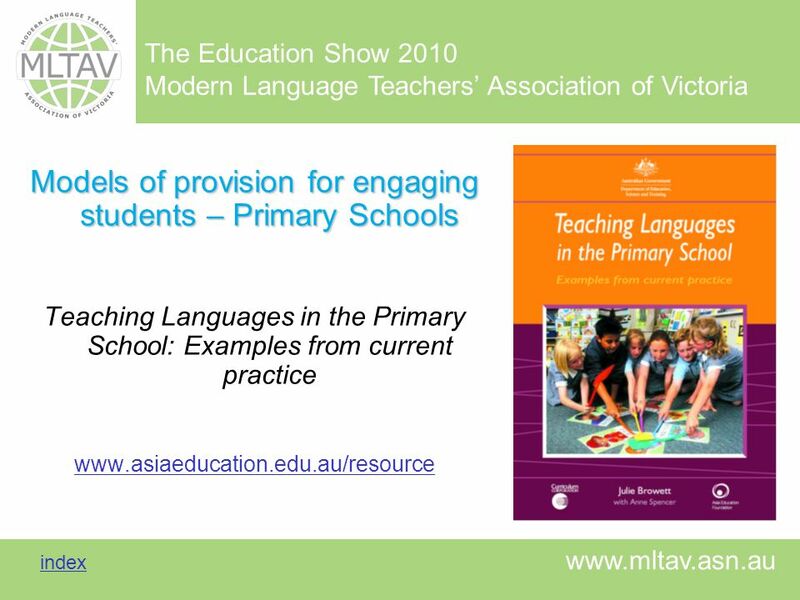 Australian Curriculum: Languages Draft Shape of the Australian Curriculum: Languages Consultation 31 January to 7 April 2011.